In this essay Evonne Levy examines the collision of Renaissance narrative or historia in the visual arts and the eyewitnessed event and the pressure put on that convergence by the dissemination of the latter in the new print media. 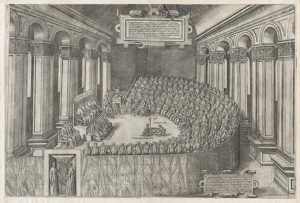 The example discussed here is the Council of Trent, a storyless but signal event that conformed with difficulty to an ideal “historia,” and one that was often depicted after eyewitnessed scenes of the event had already been disseminated in engravings. The veracity of the scene captured in a print created new chains of media: prints led to paintings, and to more prints, and images led to written history, rather than vice versa. EVONNE LEVY is Professor of Early Modern Art History at the University of Toronto. She works on the art, architecture, and historiography of the baroque in Europe and Latin America. This entry was posted in Essays and tagged Council of Trent, Prints, Renaissance, Visual Culture, Visual History, Visual Media, visual representation by Reps Admin. Bookmark the permalink.